Household goods shifting involves the shifting of all household goods from old one to new one. All goods and household stuff like clothes, furniture, fragile items, glass items, showpieces, paintings, almirahs, complete furniture, electronic equipments an items like refrigerator, television, microwave oven. 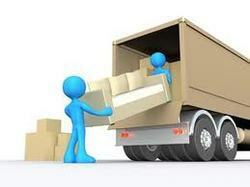 The safe and proper packaging of goods is of supreme importance to us as a renewed packers and movers. With due attention to minute details while packaging processes, our packaging experts, who work vigorously to make sure that the goods are perfectly packed and don't get damaged during transportation.